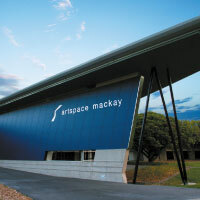 Be inspired by the highest standard of contemporary art at Artspace Mackay, with three impressive gallery spaces and an ever-changing exhibitions program. Artspace hosts a diverse range of travelling exhibitions from national and regional gallery collections, and also curates shows from its own Mackay Regional Council Artists Book Collection. Public and educational programs for all ages including art classes, workshops, master classes, lectures, seminars, performances, presentations, guided tours and events all take place at this cultural venue.